Time past so quickly that today is the 7th day of Chinese Lunar New Year(CNY) which traditionally known as “Renri (人日)” or common man's birthday where everyone grows one year older. During this day in Asia countries like Singapore and Malaysia, people gets together to toss and eat a colouful salad called “YuSheng(鱼生)” or “LoyHey(撈起)” in Cantonese. Besides having “YuSheng(鱼生)”, some of the families will also prepare this traditional “Stir-fry 7 Assorted Vegetables(七样菜)” dish with 7 different kinds of Auspicious vegetables to celebrate “Renri”. And some older folks believes that by eating these “Assorted Vegetables” dish all misfortune and bad luck will be eliminated and good luck will be bestowed on each family members in the New Year. While others explain that since everyone is having big feasts during the first 6 days of CNY, the 7th day shall be reserved for this “7 Assorted Vegetables” dish in order to clear our body system from those rich cuisines that we consumed. Below are the 7 types vegetables(pre-packed) that I bought from one of the vegetable stall near my wet market. There is no fixed rules on which vegetables you must include in this "7 Assorted Vegetables" dish. 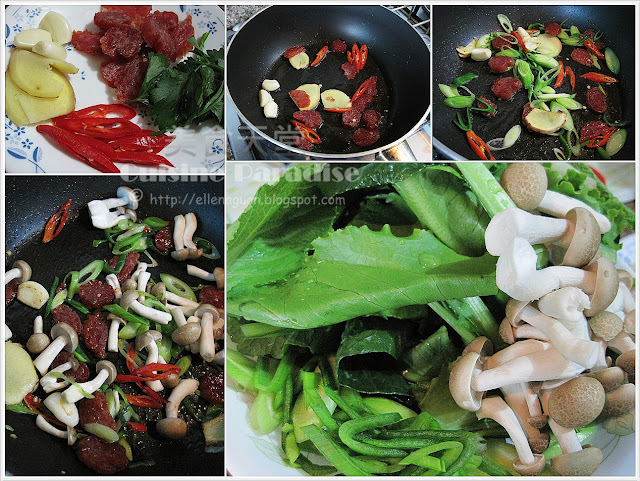 You can mix and match any 7 different types of auspicious CNY vegetables to prepare this dish and the most common vegetable will be, "Chinese Leek(大蒜)", "Lettuce(生菜)", "Black Moss(发菜)" ,"Spring Onion(葱) and etc. 1. Trim and cut the assorted vegetables accordingly, rinse well and set aside. 2. Preheat frying pan with 1 tablespoon of oil, saute ginger, garlic and chili till fragrant then toss in the sliced preserved sausage and fry for another 30 seconds. 3. Toss in the sliced leeks and stir for another 1 minutes before adding in the rest of the vegetables ,give it a quick stir before seasoning it to taste. 4. Serve hot with rice. Lastly on this "Renri(人日)" I would like to wish each and everyone of you Happy Birthday , Good Health and Prosperous in all area whole year round. This is so interesting!! Japanese also has a similar custom of cooking a 7 vege porridege sometime after their new year, theirs is fixed 7 types though. Ooops, I didnt buy vegetables so I will content with just looking at yours!